Have you been using Cloud storage for a large volume of location based data? Is your business handling large data set and the schema needs to be updated regularly? Consider the document-oriented database, MongoDB, as your perfect business solution. Avail our MongoDB development services to streamline data handling and improve business performance. Webguru Infosystems is an ISO 9001:2015 certified company providing complete MongoDB based solutions - from strategry building and development to integration, optimization and deployment. If you are considering development of a modern application or looking to improve your existing one to a fully automated, cloud based solution with improved built-in operational and security measures, talk to us. As a leading MongoDB development company in India, we have a team of experienced MongoDB developers who specialize in schema & application design, database scaling, query optimization, deployment and much more. MongoDB is great for storing vast amounts of unstructured data easily. You can add various fields quickly and conveniently according to your needs. The Power and Simplicity of MEAN Stack. MongoDB makes it easier to recall a high volume of scattered data from across the multiple servers within the cloud for better functioning. Large volume of location based data can be efficiently analyzed using the flat data structure of MongoDB. This helps in AI based decision making. MongoDB cuts down hardware and storage costs resulting in an economic solution for your business. ReplicaSet (primary and secondary server) in MongoDB is easy and fast. The secondary server becomes the primary server automatically if any issue arise. If you want to avail the aforementioned benefits, MongoDB development is the right solution for you. Hire MongoDB developers from Webguru Infosystems to ensure quality work and fast deployment. 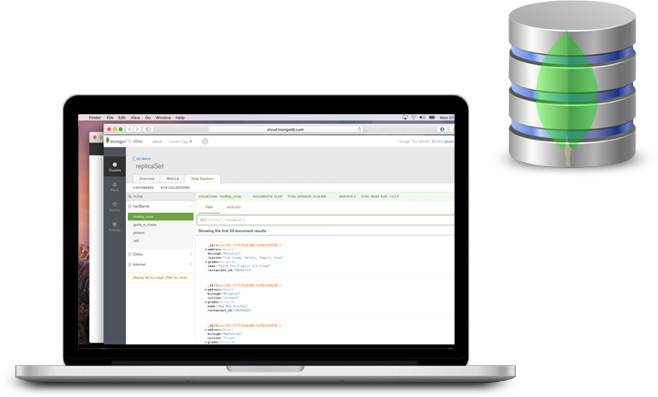 Our agile development methodology is best suited for MongoDB. Our coding is clean to ensure problems are kept to the minimum. Our in-house team comprises of Analysts, UI/UX Designers & Developers. We provider quality solution at an economic price point.